Let me ask today – Do you believe this? For it is the belief in Christ’s resurrection of Christ that gives us as Christians – hope today. It is the validation that there is life beyond this life. That there is something more that awaits us. Saturday, April 27 will be a clean-up day at the Barlow Cemetery. Families with loved and/or ancestors buried in the cemetery are encouraged to participate. The clean-up will be from 10 a.m. to 1:30 p.m. Families with relatives at Barlow include but are not limited to: Whalen, Williams, Case, Ishmael, Field, Turner and Kelly. The cemetery is on Barlow Pike between Oddville and Sunrise. Mulch has become a landscape staple, almost to a fault when it is over applied, smothering roots and girdling trunks. When done properly is can help to suppress weeds, retain moisture and moderate temperature. These things can be achieved using a variety of materials but which type of mulch suits your needs best? Births announced this week are: Kelly Frank “Frankie” Grubbs, March 6, son of Kelly Wayne and Kelly Lynn Grubbs; Kali Lynn Morrison, March 17, daughter of Michael Scott Morrison and Chelsea Hall; Ally Elizabeth Tolliver, Dec. 11, daughter of David and Elizabeth Tolliver. Kentucky Bank will be consolidating the downtown location with the Cynthiana U.S. 27 office. The Main Street Branch will be closing. This should take effect in May. 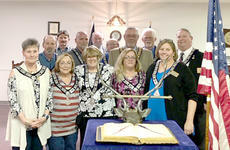 The March 4th meeting of Omega chapter of Beta Sigma Phi was hosted by Barbara Snopek. Members answered roll call by remembering when they saw their husband for the first time. International contacted the chapter and asked if they would like a list of all the former members of this chapter. A reply card will be sent in to request that information. Under local correspondence, a thank you note was read from the local Clothing Closet for the clothes and money donations received from the chapter.